Anyone who has read about the American Transcendentalists knows Margaret Fuller, a friend of Ralph Waldo Emerson and editor of The Dial, the short-lived journal of the Transcendentalist movement. But most histories of the movement tend to focus on the men, Emerson, Thoreau, and Bronson Alcott, perhaps giving short shrift to Fuller and other women, such as Elizabeth Peabody, in the movement. It is a good thing, then to have this biography, which describes not only Fuller’s role in the Transcendentalist movement, but her early life with her disciplinarian father, her sojourn to the Midwest (then thought of as simply the West), her time in New York writing for Horace Greeley’s New York Tribune, and her journey to Europe where she fell in love with an Italian and had a child with him. Anyone who knows this history is aware that Fuller died in a shipwreck on her return from Europe, just hundreds of yards offshore with her partner and son. For anyone interested in this period of American history or the history of the Transcendentalist circle this is worthwhile reading. It fills in many of the gaps in Fuller’s life that the general histories tend to omit. No doubt you’re aware of the announcement that was made the first week of March about the sale of the Safeway grocery chain to Cerberus Capital Management. My immediate reaction was that a grocery chain being owned by a private equity firm is not a Good Thing. I was not much comforted by all the love and light being spouted by the analysts, including on KQED’s Forum, talking about how the chain would now be able to run smaller, more friendly stores with merchandise tailored to each local community. I can’t help but agree with Thomas Lee in the San Francisco Chronicle, who wrote, “As a general rule in business, companies that attract the pockets of large private equity firms, especially ones named after a mythical three-headed hellhound, are in deep trouble.” I have to agree. It is true that privately held companies have more flexibility because they are not beholden to the stockholders. And privately held companies can and do deliver a good shopping experience and quality products. Witness Trader Joe’s and In-n-Out burger. But a privately held company focused on managing a single business well is not the same as a private equity firm. Cerberus is, after all, the firm that once owned Chrysler. As Lee writes, “Private equity’s primary goal – perhaps its only goal – is to make money for its investors within five years or so, not necessarily to ensure the survival of Safeway.” He says, “Of course, Cerberus would prefer to generate profits the old-fashioned way: running the business well.” But, of course Lee tell us that if that doesn’t work, Cerberus has the option to “Sell! Sell! Sell!” Sell store real estate. Sell manufacturing and food processing plants. Sell distribution facilities. The mantra that is constantly being repeated is that the grocery business is changing. That is true. The truism that Safeway is being squeezed by the likes of Costco and Wal-Mart on one side and specialty retailers like Trader Joe’s and Whole Foods on the other is in fact true. I, myself, am a contributor in my own small way to the sale. I shop at our regional grocery chain, Nob Hill. I shop at our local Rocca’s market. I make my weekly stop at Trader Joe’s after church. I pick up oranges and sometimes veggies at Kachy’s, our local Latino produce market. I buy guacamole and marinated meats at the upscale Latino chain, Mi Pueblo. And sometimes I pop in and pick up a couple of things at Safeway. So there you have it. Guilty. Guilty. Guilty. The sale isn’t likely to close until the end of this year after the regulators have had a chance to mull this over. It will obviously a while after that before we know what the long-term effects are. In the 1980’s my regular Friday night television viewing included Washington Week in Review and Wall Street Week. When Louis Rukeyser gave the market recap for the week on WSW, he would always refer to the technical index “elves.” He seemed to have little regard for technical analysis (“the forecasting of future financial price movements based on an examination of past price movements,” according to one Web site), but it was always good for a chuckle, or at least a slight grin. 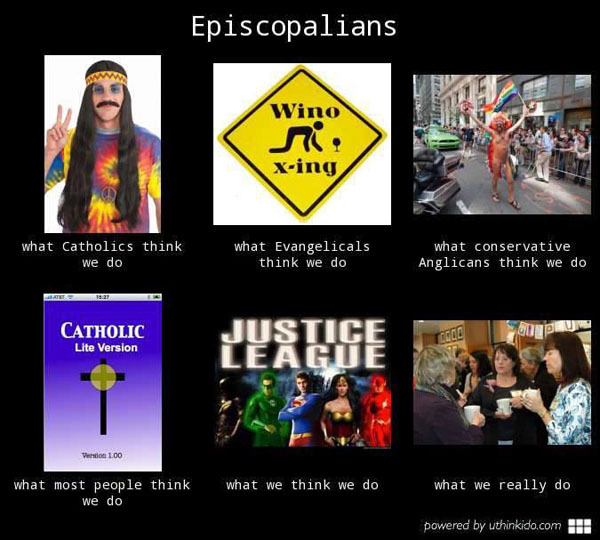 A few years ago I heard a podcast sermon in which the Episcopal priest made reference to the “lectionary elves.” That stuck with me. The Episcopal Church, with a one or two exceptions during the course of the liturgical year, adopted the Revised Common Lectionary a few years back. The RCL was officially released in 1994, and while it was compiled by real people working together, it is easy for me to perceive it as coming from some misty, mystical source. The RCL is certainly inscrutable at times. The Emmaus story in Luke only appears once in the three-year cycle for Sunday morning, and that is in Year A, the year of Matthew. I’m noticing that this Lent (where we are in Year A) Matthew is preempted for John from Lent 2 until we get Matthew’s version of the Passion story on Palm Sunday. It’s oddities like that which make me appreciate the term “lectionary elves.” But I use it with complete respect, of course. The Interestings is the story of a group of friends over the span of decades. Jules is a lower-middle class high school girl who has the opportunity to attend an arts summer camp on scholarship where most of the attendees are upper class New York kids. She is welcomed into the group and those relationships continue throughout their lives. Wolitzer does some interesting footwork with her chronology. The book begins with their high school summers at the Spirit in-the-woods arts camp in the mid-1970’s. She then jumps ahead to 2008 where we see what their lives have become. But she quickly takes us back to their college years and then chronologically moves us ahead through weddings, careers, children, and deaths. She takes us through and past 9-11, quickly passes by 2008, and closes the story in 2010 with the friends in middle age and their children through college. All of this is done seamlessly and deftly. Wolitzer is a fine storyteller. I found the characters believable and I cared about what happened to them. I was a bit annoyed with the fate that she dished out on a couple of the characters, but what she did was consistent with the storyline and character development. I certainly can’t fault her. If you are looking for an engrossing contemporary novel based on character development The Interestings is a worthwhile choice. The Saint Paul Cathedral Choir sings the John Rutter arrangement of this classic hymn.